Haven in the Willows is a self-catered, fully appointed vacation rental. Rentals can occur on a daily, weekly or monthly basis. The rental comes fully furnished; complete with a fridge and freezer, ceramic top stove and microwave as well as a selection of glassware, dishes, cooking utensils and pots/pans to service all your culinary needs. Towels and linens are also supplied for the duration of your stay. Haven in the Willows Vacation Rental is a beautiful open concept and comfortably furnished log home that boasts 23 foot ceilings and over 1500 square feet of living space. 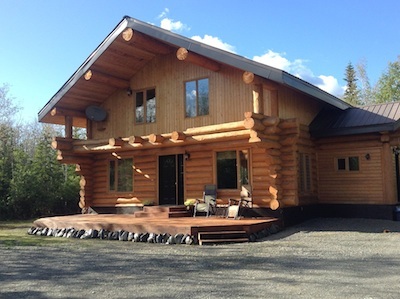 Haven in the Willows is perfect for friend or family group vacations, romantic couple getaways, or a stop over from your travels as you enjoy the activities and adventures of the Kluane Region or en-route to Alaska. The property is close to many lakes and beaches such as Pine Lake which is less than a 10 minute drive and is an excellent place for a picnic and to spend the day at the beach! This impressive home is surrounded by over 3 acres of private property and is nestled among the spruce, poplar and willow trees of the area. It offers luxurious amenities and serene surroundings combined with stunning views of the majestic St. Elias Mountain Range. Haven in the Willows delivers the right amount of tranquility and peacefulness of country living, yet is close enough to community activities and events as well as all the adventures that the Kluane National Park and Reserve has to offer.